Here are some handy links if you're just getting started or are still considering the RV life. 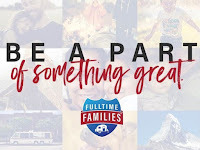 • If you're bringing kids, FulltimeFamilies.com has many resources, articles, videos, stories, and fantastic events to gather together with other fulltime families. Click on Start Here if you're new. • At Technomadia.com, No Excuses: Go Nomadic is a powerful resource that includes information about jobs, pets, community, mail, domicile, healthcare, wifi, and much more. 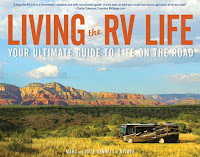 • RVLove.com has a ton of info, blog posts, a book, and courses, but begin with the links under Start Here for practical steps to get started. • The Fulltime Families Facebook Group has 28,000+ members and is a great place to get connected with the fulltime community. • RVillage is all about the nomadic community, with special interest groups, an updatable map so you can find new friends nearby, events, blogs, businesses, and more. 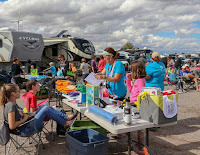 • Escapees (or SKPs) is a helpful RV Club for all ages and stages of RVing, and their group, Xcapers, for working-age RVers, offers support for jobs, wifi, family travel, and community both online and at gatherings called convergences. • The Gebbia family blogs at 4 Radical Roadschoolers and a Fat Cat. They're a nomadic family of four and their cat is indeed quite fat (and adorable)! • The family of four at Light Our Path focuses on serving others. They're on a journey of faith, family, and freedom. • The Elhajj family at Chase The Sky is a family of seven. They hit the road in 2016 and have visited all 50 states! Of course we share our adventures right here at Lundy5.com and you can find other blogs to follow at Fulltime Families or Ditching Suburbia.